The watches in the NOMOS Tetra collection combine square cases with colorful dials. They feature precise in-house movements such as the manual Alpha and automatic Neomatik calibers. The NOMOS Tetra combines the elegance of a square case with the playfulness of brightly colored dials. The company chose the name Tetra, the Greek word for the number four, in reference to the case's four sides. Its design helps this timepiece stand out from the crowd while maintaining the straight lines, simplicity, and elegance that defines NOMOS watches. 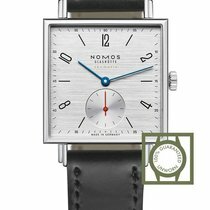 Most NOMOS watches are unisex. This Saxon manufacturer produces the Tetra in three sizes: 27.5 x 27.5 mm, 29.5 x 29.5 mm, and 33 x 33 mm. The 29.5 x 29.5-mm model grabs a lot of attention on smaller wrists, but feels more formal on larger ones. The smallest models feel especially feminine and make great women's watches. At 6 to 7 mm thick, every Tetra is remarkably flat. The manual caliber Alpha ticks away inside most of these timepieces and has been powering the Glashütte-based company's bestseller, the Tangente, since 1992. However, the Tetra collection also includes automatic watches, which feature the extra-flat caliber DUW 3001 from the Neomatik series. Dial colors range from classic white to pomegranate red, mint green, and various shades of blue. Tetra cases are made exclusively of stainless steel. When it comes to the strap, you can choose between smooth cordovan leather or suede in colors like gray and brown. Some models come with a sapphire glass case back, allowing you to view the movement inside. How much does a Tetra cost? The Tetra has been in production since 2007, so the market has a few pre-owned timepieces available at good prices. Classic models in good condition sell for around 1,200 USD. 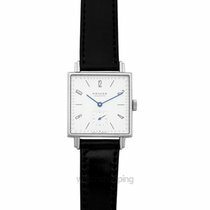 Most of the watches in this price range are 27.5 x 27.5 mm and are worn with a black cordovan leather strap. They feature black or blue tempered hands, the latter of which contrasts beautifully with the white dial. The older manual caliber NOMOS 1 TS powers these timepieces. This movement is based on the ETA caliber Peseux 7001. You can purchase similar never-worn models, such as those in the Tetra 27 series, for about 1,500 USD. If you're on the market for an automatic watch, you may enjoy the Tetra Neomatik. These watches are 33 x 33 mm and are more masculine than the smaller models. The red small seconds hand gives these timepieces an additional sporty touch. The Tetra Neomatik Midnight Blue gets its name from its dark blue dial and costs around 2,900 USD new. The Tetra Neomatik Silvercut feels even more contemporary thanks to its silver dial and sits in a similar price range. The Berlin series contains a quartet of special watches within the larger Tetra collection. Their colorful dials lend these timepieces a certain "Berlin chic." Each watch has a connection to the city. The Tetra Clärchen gets its name from the eponymous ballroom in central Berlin, where people have been dancing for over 100 years. Its dial is green like a pool table, and its hands are plated with gold. Every model in the Berlin set comes on a gray suede strap. New watches sell for about 1,900 USD. The Goldelse is the Berlin quartet's most elegant member thanks to its rose gold dial. Its design was inspired by the golden Victoria statue atop Berlin's Victory Column. Then there's the Tetra Nachtijall with its navy blue dial and golden hands. This timepiece steps just outside Berlin and pays homage to the nightingales in the nearby forests. Both models cost about the same as the Clärchen. The Tetra Kleene, named after the local Berlin pronunciation of the German word "klein" or "small," is larger than you might think. While it shares its sister models' 29-mm case, it is powered by the caliber DUW 4301 with a power reserve display. 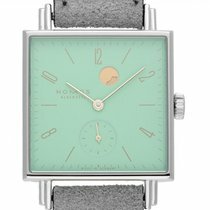 Its mint green dial and gold-plated hands contrast nicely with the stainless steel case. A mint-condition Kleene demands around 2,300 USD. The special Tetra Petit Four series features dials in four pastel hues: pomegranate red, rose, sage green, and sky blue. These models feel especially playful thanks to the use of different colors for the hands and indices. An Alpha movement ticks away inside each of these timepieces. You can purchase the Tetra Matcha and Azure for about 1,700 USD new. The Grenadine and Pearl models cost about 230 USD more. Many Tetra timepieces feature the proven in-house caliber Alpha. This movement is 23.3 mm in diameter, an incredible 2.6 mm thick, and has a power reserve of 43 hours. It also comes with a small seconds dial at 6 o'clock, a stop seconds mechanism, and a Glashütte three-quarter plate. A Glashütte stopwork, tempered blue screws, 17 rubies, and the Incabloc shock protection system round out this movement's features. Building a water-resistant square case with a round movement inside is a true watchmaking challenge. However, this Glashütte-based watch manufacturer found a way: The Tetra is water resistant to 3 bar. NOMOS is outfitting more and more watches in this collection with automatic movements such as the DUW 3001. This caliber caused quite a lot of excitement upon its launch in 2015 thanks to its extra-flat construction and comparably moderate price. The DUW 3001 is only 3.2 mm thick and fits perfectly in the Tetra's thin case. The addition of the word "Neomatik" lets you know which movement each watch contains.